At Chesterfield Minibus Hire, unlike many of our competitors, we don’t turn away stag and hen parties. We know that you will have a great night, or even weekend, but behave responsible too. Our driver can collect each member of your party from their home, or, alternatively from a central pick up point. At the end of the evening, Chesterfield Minibus Hire will drop everyone off at a location of their choice. Our drivers, whilst of course unable to join in the fun, do enter into the sprint of the event and you can be assured they will do everything they can to keep your party safe throughout. 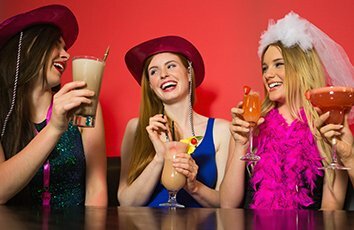 There are some great options for hen and stag events in the Chesterfield area. Perhaps you are planning your event with a company such as Hard Days Night, which has accommodation in a number of locations in the Peak District where you can engage in a range of exciting activities. Maybe you are staying local, visiting some of the clubs in town; The Vibe, or Beech Grove. If enjoying all that Nottingham, or Sheffield has to offer is you aim, we can arrange that too. Our driver will drop you at each venue en route and collect you again when you are ready to move on. At Chesterfield Minibus Hire, we guarantee, you will have a fantastic stag or hen night.